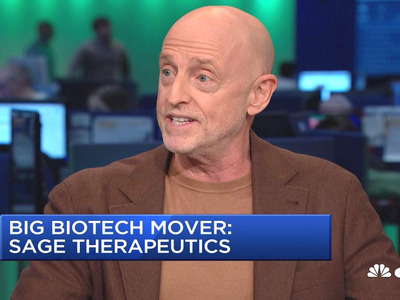 Investors’ excitement about a promising new drug for depression reached a fever pitch last week when the CEO of the company behind it likened the drug to an antibiotic. Sage Therapeutics’ CEO Jeff Jonas said the drug, called SAGE-217, could be administered like a two-week course of antibiotics, which are given only once. A once-only course of treatment is essentially unheard of for depression, and experts within and outside of the company say they doubt that’s how SAGE-217 would actually work. Instead, they say it would likely need to be given monthly. Sage has yet to complete any long-term studies of the drug. This drug has the “potential for patients with major depressive disorder to feel well within days, with just a two week course of treatment – similar to how antibiotics are used today – instead of enduring long-term chronic treatment,” Sage Therapeutics’ CEO Jeff Jonas said on Tuesday of his company’s drug, SAGE-217. The comments came shortly after the company said it had received the green light from the Food and Drug Administration to accelerate the approval process for its drug. A once-only course of treatment is essentially unheard of for depression or for any other chronic disease. And experts within and outside of the company say they doubt that’s how SAGE-217 would actually work. Instead of working as a once-only treatment, they said that data on the drug suggest that its effects would likely last as long as one month. Patients would still need to take the drug regularly for long-lasting results. More importantly, although the drug has shown a promising potential ability to treat depression in preliminary studies, those findings have yet to be borne out by the kinds of longer and larger trials that are needed before it gets anywhere near federal approval. Depression is the leading cause of disability worldwide, and it can kill. While not the sole cause of suicide, depression is often a contributing factor. And while suicide rates have climbed for nearly 20 years, not a single new drug for depression has emerged. Most treatments for depression and suicidal thinking are limited to a narrow class of drugs known as selective serotonin reuptake inhibitors, or SSRIs, which includes popular drugs like Prozac and Lexapro. While they can help some people, failure rates hover around 50%. So researchers are on the hunt for better options – options that could soon include Sage’s new compound, which preliminary studies have suggested works well to treat depressive symptoms within a short time period. But Sage’s drug wouldn’t be a one-and-done kind of depression treatment, according to researchers within and outside the company. In sharp contrast to what Sage CEO Jeff Jonas suggested last week, the drug would most likely need to be administered regularly, possibly as frequently as every month, Gerard Sanacora, the director of the Yale Depression Research Program and a clinical advisor to Sage, told Business Insider. “There will need to be further studies” to help the team fully understand how well SAGE-217 works and how long its depression-relieving effects last, Sanacora said. Cristina Cusin, a psychiatrist at Massachusetts General Hospital and an assistant professor at Harvard University who specialises in depression, cautioned that she’s seen many promising drug candidates for depression fail once they get to the last phase of clinical study – phase 3. Sage has yet to complete those studies.